Maynard Webb has always been the go-to guy when Silicon Valley companies have thorny problems. Whether revamping eBay's crashing servers (transforming their technology weaknesses into a competitive strength) or investing in emerging technology start-ups, Webb brings strategic and operational savvy to every issue and venture. In his first book, Webb brings this same focus to tackle outdated models of work, created a century ago, which no longer sync up with either individual or employers' needs. Through a unique framework, Webb identifies 4 different mindsets around work (the company man, CEO of your own destiny, disenchanted employee, and the aspiring entrepreneur). It organizes those who are self-motivated versus those who are waiting to be discovered and aims to give readers the tools to become more self-actualized, happier, and ultimately more fulfilled in their careers. In identifying a paradigm shift that is already under way, Webb demonstrates clearly how to harness technology to embrace our own personal happiness, allowing people to become more productive at work and also spend more time with their families. 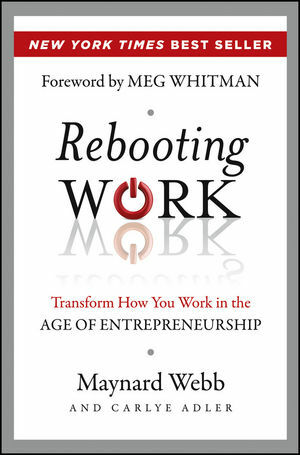 Rebooting Work reveals how anyone can take control of his or her own future, finding greater fulfillment, productivity, and happiness. Maynard Webb is the chairman (and former CEO) of LiveOps and a board member at both salesforce.com and Yahoo! Previously he was the COO of eBay. He is the founder of the Webb Investment Network (WIN) as well as the Webb Family Foundation. He lives with his wife, Irene, in Silicon Valley. For more information, please visit www.rebootingwork.com. Carlye Adler is an award-winning journalist and bestselling author. She is co- author, with Marc Benioff, of Behind the Cloud and The Business of Changing the World, as well as coauthor of The Dragonfly Effect. She lives in New York. For more information, please visit www.carlyeadler.com. —James M. Citrin, leader, CEO and board practice, Spencer Stuart; author, You Need a Leader, Now What?